The Trump rally on Wall Street was built on hopes of massive tax cuts. With tax reform's fate uncertain in Washington, the rally is now being kept alive by massive corporate profits. Corporate America achieved stellar profit growth during the first quarter, the fastest pace since 2011. Second-quarter results from major U.S. companies start to trickle in this week. Pepsi (PEP) posted so-so numbers on Tuesday. Key reports from JPMorgan Chase (JPM) and Wells Fargo (WFC) are out on Friday. Given the lack of action on President Trump's economic agenda, Wall Street will need companies to keep growing their bottom lines at an impressive clip. The bad news for the market is that corporate profits likely won't repeat the incredible growth of 15% during the first quarter -- a performance that Bank of America Merrill Lynch hailed "as good as it gets." The good news is that virtually everyone thinks S&P 500 earnings will grow again, marking the fourth straight quarter. That's very important because earnings, not politics (or tweets), typically drive stock prices. FactSet predicts that S&P 500 earnings will be up by a solid 6.5% during the second quarter. Actual growth is likely to be stronger than that because analysts typically low-ball their estimates, making it easier for companies to "beat" the numbers. "Growth should decelerate but remain healthy after a great" first quarter, Bank of America Merrill Lynch predicted in a report on Monday. If that plays out, U.S. stocks could build on a terrific first half of the year. The Dow and S&P 500 are up more than 8% so far in 2017, while the Nasdaq has soared about 15% thanks to strength from tech stocks. Stronger earnings could ease concerns about how expensive U.S. stocks have become by letting them grow into their lofty valuations. The S&P 500 is trading at about 17.3 times projected earnings over the next 12 months. That's well above the 10-year average. But it's down from earlier this year when the so-called P/E ratio hit a 13-year high of 17.9. Stocks have performed very well this year despite the nonstop drama in D.C. (see: the latest controversy over Donald Trump Jr.) and the lack of progress in Congress on Trump's promises of tax cuts, deregulation and infrastructure spending. Efforts to repeal and replace Obamacare have also failed so far. "Domestic policy paralysis" has pushed back the timing of fiscal stimulus, according to Terry Sandven, chief equity strategist at U.S. Bank Wealth Management. He said he expects tax reform to still happen -- but not have an impact on boosting companies' bottom lines until 2018. Others think the attention on Washington's drama is a distraction from the fundamentals that investors should care about: earnings and the economy. "The worst thing for markets is to focus on what's happening in Washington. 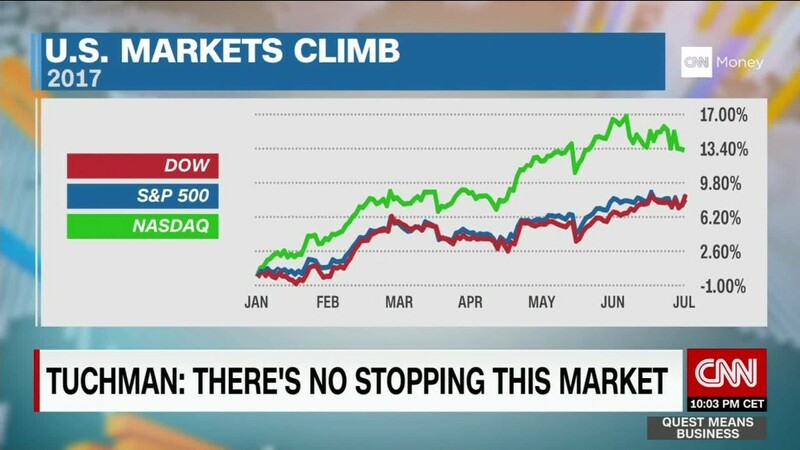 That's just not what drives markets in the long term," said Andres Garcia-Amaya, global market strategist at Zoe Financial, an independent wealth management firm. BlackRock is betting the so-so economic recovery will continue for some time, with no recession in sight to dent corporate profits. "There's reason to believe profitability can continue for multiple quarters, if not years," said Kate Moore, chief equity strategist at BlackRock. Earnings growth during the second quarter is expected to be led by energy companies. CFRA Research predicts the energy sector will post "meteoric" profit growth of 387% from last year thanks to higher, albeit still volatile, oil prices. But CFRA warns energy bulls not to get "too excited." The huge earnings growth this quarter says more about how "poor" last year was than about any real strength this year. The focus later this week will be on earnings from big banks JPMorgan Chase, Citigroup (C) and Wells Fargo. Financial profits are expected to tick higher, despite a weak trading environment and slow loan growth. Wall Street is drooling over the likelihood that the clean bill of health big banks were given in the recent Federal Reserve stress tests will allow them to continue to ramp up dividends and share buybacks. "If CEOs don't sell the idea that they return money back to investors, you could get a market that gets turned off," said Garcia-Amaya. As always, Wall Street will be listening to what execs say about the environment for doing business going forward. Corporate optimism spiked after the election, but slow progress on the Trump agenda could change that. "We suspect corporates could temper their tone...given growing uncertainty around growth and tax reform/stimulus," Bank of America wrote.